Photo: Casino/SHOWTIME – By Scott Gilfoid: Instead of beating up on Carl Froch again or facing unbeaten but still unproven IBF super middleweight champion Lucian Bute next, WBA/WBC super middleweight champion Andre Ward (25-0, 13 KO’s) will likely face his No.1 ranked WBC mandatory challenger Anthony Dirrell (24-0, 21 KO’s) next in the first quarter of 2012. Before anyone starts yapping about Ward ducking a fight against Bute, let me just say that the 27-year-old Dirrell is likely going to be a much bigger test than the slower, older Bute can ever hope to be. Dirrell is simply put a better all-around fighter compared to the 31-year-old Bute, and we’re going to see that next year. Dirrell has better hand speed, slightly better power, better defensive skills and a much better jab compared to Bute. The only area I can give Bute an edge in is with his footwork. Bute is quick on the retreat if his opponents even look at him wrong. The guy takes off like a scolded dog when his opponents come after him to try and land something. In contrast, Dirrell is much more relaxed, and doesn’t stress out when his opposition tries to fight back. Dirrell stays in the pocket, keeping calm, and blocking incoming fire and returning fire with his own missiles. 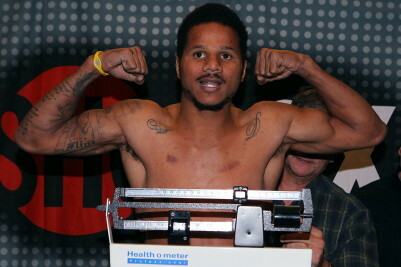 Dirrell doesn’t run around because he doesn’t need to. He’s got a great chin, excellent counter punching ability and he’s good at blocking punches. He doesn’t waste energy like Bute does. I think Anthony Dirrell is going to give Ward a lot of problems and I can see this fight being a much better than any fight that Ward had in the Super Six tournament. Anthony can do everything that his talented brother Andre Dirrell can do, but he’s a much bigger puncher who thinks offense 24/7. And unlike the slow as molasses Froch, Anthony Dirrell has the speed and the accuracy to land his shots against Ward. He also has a superb inside game, so if the fight ends up on the inside where Ward likes to fight, Dirrell will be more than ready for that kind of battle. Dirrell will show Froch it’s done and it’s going to be shocking how much better Dirrell is compared to Froch.